Home / Lessons / How to Form a Band: Create An ‘Ukulele Supergroup! How to Form a Band: Create An ‘Ukulele Supergroup! Creating a band and playing publicly for people is one of the most satisfying ways of sharing music. Even if you don’t go on to become a world famous group, it is well worth your time to pursue forming a band if it’s something you are interested in. I don’t claim to know everything and I’m not by any means in a touring band, but lately I’ve been playing in various groups and this is what I’ve found to be important. When you are setting up a group, one of the main things to consider is what kinds of instrumentation you want to have. This also goes along with how many guys (or gals) you want in the band. Fewer people means you have to work a bit harder at filling space, but it is also easier to stay out of each other’s way sonic-ly. More band members means you must be more cautious about arranging parts and making sure you aren’t all playing the same voicing of a chord, but it also makes it easier to keep space filled. The above point revolves around what instruments are in the band. If you have an ‘ukulele, guitar, drums, bass, keys, sax, and a steel guitar you would probably be in pretty good shape, even if there are seven people in the band (which is kind of a lot). Since each instrument has a unique tone it would be easy to make all the parts blend and sound clean. But if you were to have seven ‘ukulele players it would be a complete nightmare. Everyone would be playing over each other and it would sound totally muddy no matter how many cool parts you arranged. 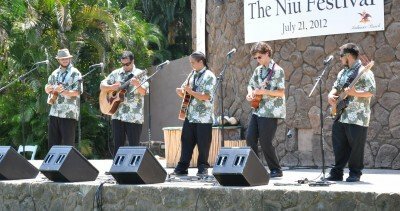 I’ve performed several times with three ‘ukulele players and it was really hard to keep the sound clean – even though one of us was playing open chords, one was playing a higher inversion, and one was doing fills. This is only magnified when you play plugged in because of the short-fallings of acoustic pickups. Only experience will inform you as to what kind of instrumentation you like. My personal preference would be to avoid having duplicate instruments in a group. This almost never happens in my current situation, but I like the challenge or arranging fewer parts to create a tight, simple sound. Picking the tunes you are going to play is one of the most fun parts of being in a band because you realize that you can take on more detailed songs and use all the instruments to their full potential. The first time I realized I could do a decent cover of the Sunday Manoa’s Kawika with my band I was stoked for days. The structure of the song (chord changes, order of sections). What instrument or voice is going to play or sing what part. The structure of the song can be as simple or elaborate as you like. I would consider a “simple” arrangement one that is exactly like how the song was recorded. Consider doing something interesting with the song – change keys between verses, make a new intro or outro, create your own vamp, etc… Make it your own. If people want to just hear the song as it was recorded they will buy it on itunes. Figuring out the instrumentation can be more challenging. A lot of times it is easy for the ‘ukulele player because the only thing you need to cover is the simple open-position chords. But when you have more than one ‘ukulele you might want to have one guy play open chords and the other play either a higher inversion or some sort of repeating picking pattern. Vocals are the main part of a non-instrumental song so you’ve got to make sure the people singing know what parts they are supposed to be covering. Unless all of you can sing perfect four-part harmony at the drop of a hat you might have to take the time to figure out the parts and learn them. It will sound way better than guessing whether or not the other guy is going to take the high line or not. It’s really important. Get in sync or lock the guilty parties in a closet with a metronome. Just kidding. But you’ve got to get your band’s groove together somehow. You’ve got to have a place to play. Be it a farmers market or an arena, somebody has to land the gig and set it up. Start small and be willing to play for free. If people like what they hear they will provide more opportunities for you to perform. One thing leads to another, you’ve just got to get out in front of the public. Once you have a place to play be sure you and the venue agree on the performance area and provided equipment. Is there a stage, a PA, a soundman? If there is a PA make sure you know what kind it is. Don’t assume there is going to be a 32-channel Yamaha board, monitors, and powered JBL speakers. One man’s PA is another person’s karaoke machine. Always bring your own 1/4″ instrument cable to plug in your ‘ukulele since it’s not something the venue usually provides. At the end of all the practice and planning is the big hurrah – the show! I highly recommend making a setlist of songs you’ll perform and in what order. If you play one song in several keys (depending on how the vocalist feels or who sings), make a note of what key you’re going to be using for this show. Try to create a little bit of emotional flow in the setlist by mixing up fast and slow songs. You can even do transitions from one song to another without missing a beat (called a “medley”). Begin with one of your better songs. End with a bang. Put the main instrumentalists or singers in the middle (think Freddy Mercury). Arrange the instruments in a pattern – for example: keys, ‘ukulele, guitar, ‘ukulele, bass. Don’t block anybody who might be “in the back.” If you must have somebody in the back get them up on a riser if possible. Depending on how many times you’ve performed you might get really nervous. It’s not bad to be nervous, but you should try and focus that energy into your playing instead of letting it run rampant on your self doubts. The nerves are what get you excited to play. The day they go away completely you might want to reconsider what you are doing. When you are playing, remember to face the crowd (after all that’s why you are performing and not practicing). Don’t be afraid to introduce your songs and tell stories about them. Of course, this kind of depends on the gig. If you are playing background music in a restaurant, stay quiet and just play the music. But for a real concert where you are the center of attention beef up the banter. Keep the crowd engaged. Humor is good. Think of what you want to say before hand. Don’t dawdle or you’ll lose the hard-earned attention of your audience. Know what chit-chat or song is next and execute it. Sell your show. When it is your turn to sing – sing! When it’s your time to solo – solo! Step out in front of the band and kill it. You’ve only got until the end of the show to make an impression on the audience. Depending on your locale, plan on incorporating a “hana hou” song (encore) so you don’t go over your time (unless you are someplace where it’s okay to play longer). If you do a good job you should be able to get in a hana hou and end right on time. If you don’t get one, you’re done five minutes early. It’s kind of a gamble, but you should be able to judge whether or not you can get away with a “pretend ending.” Either way you are ending at the same time. Get off the stage in a timely manner and enjoy your accomplishment. Work together and have fun. It doesn’t have to be serious. What are the odds you’ll pay the bills by playing in a band? Really? How serious can you be?